To search for a part number, you can search two different ways. Begin by using the Advanced Search option at the top of the main page. Use the Part Number field from the drop down menu. You can also search using the Full Text tab at the top of the main page. From here you would type part:160 and hit the search button. 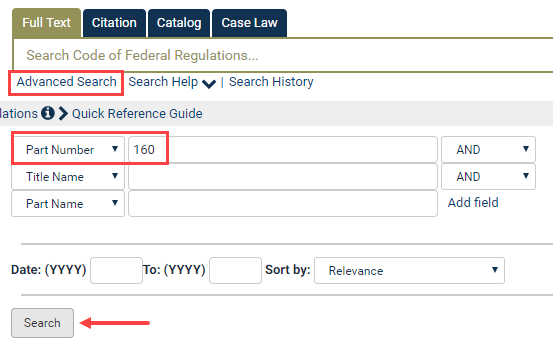 To search for a part name, you can follow the same instructions as above. For the Advanced Search, you will use the Part Name field from the drop down menu. You can also search using the Full Text tab at the top of the main page. 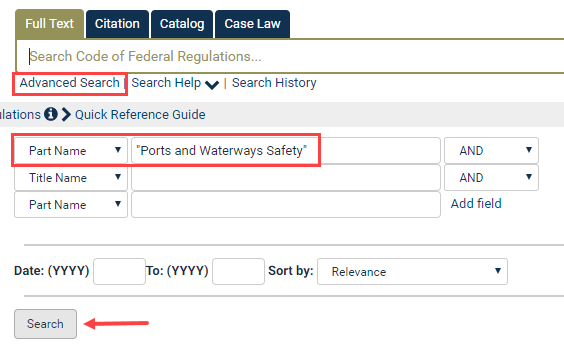 From here you would type part_title:”Ports and Waterways Safety” and hit the search button.